•For the network algorithms to process correctly all polylines must point in a source to mouth direction. •Polylines labelled zero from Strahler ordering or recognised as pointing upstream during Shreve ordering must be corrected. Flipping a polyline alters the direction of the line but does not swap node values in the attribute table. You must change these manually or re-run RivEX and compute the new node ID values. 2.Select the polyline that is pointing in the wrong direction and click on the Edit vertices button ( ) on the editor tool bar to display the individual vertices. It's vertices will display as green squares. The red vertex is the To-Node. 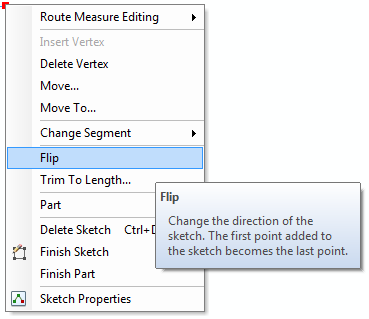 3.Right click on the selected polyline and select Flip from the menu. Note that the red vertex will swap to the other end of the polyline, indicating the polyline has been flipped. 4.Remember to stop editing and save your changes. Remember you must update the To- and From- node fields to reflect the change of direction. You must allow RivEX to rebuild them for you after you have saved you edits as this updates the TopoCache.